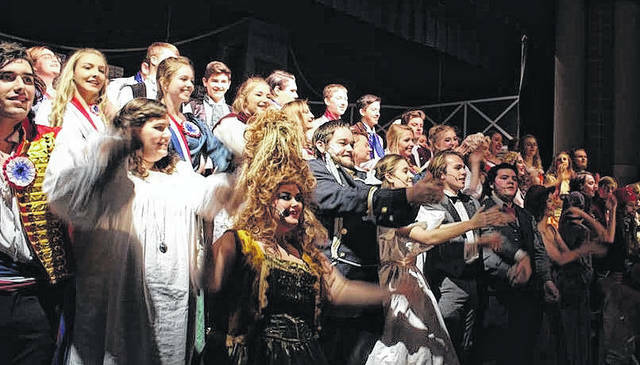 The cast of “Les Miserables,” including Jordan Willis, Trista Ball, Alec Arnett, Addison Guilliams, Seth Shepherd and Austin Scott (in front). One of the best renditions of “Les Miserables,” performed in front of a sold out crowd and amidst recent rain and incessant flooding that surrounded them, featured talented students from the Portsmouth West Music and Arts Department, led by Linda Tieman, in a recent reprisal of the iconic musical. 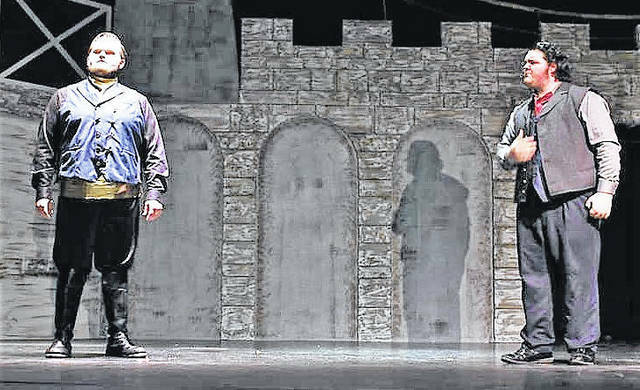 While it was not only a marvelous play, it was exquisitely portrayed with voices that could compete with some of the best known, and surprisingly done by local high school students. A small group from the play recalled what it was like to be the stars. Senior Noah Lovins did a spectacular job conducting the orchestra. Lovins says he originally was going to be an army officer, but was given the opportunity to lead the orchestra, and he jumped at the chance and did a great job. This, he says, gave him a good start for college, as musical direction is his intended major. Senior Trista Ball and sophomore Levi Kouns were the comic relief in such a gloomy sad play. 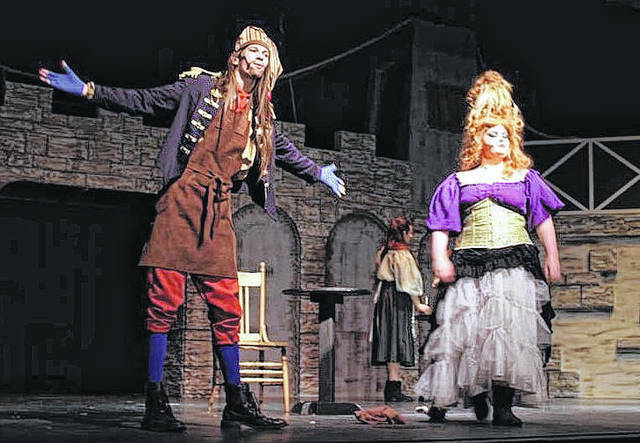 They portrayed Madame Thenardier and Thenardier, respectively. Ball observed how dark the play was, and that it was fun to bring some humor with her character. Kouns carried on so much while on stage, most would assume he’s normally a funny guy. But he says he became this character “basically by learning slowly, while playing the part, and doing things Mrs.T (Tieman) would need me to do.” As others spoke up, saying he is pretty much nothing like the hilarious character the audience enjoyed, they say he is more stoic most of the time. This harkens back to what senior Seth Shepherd had said in an interview before the play, that once the lights came on, Kouns became that character. 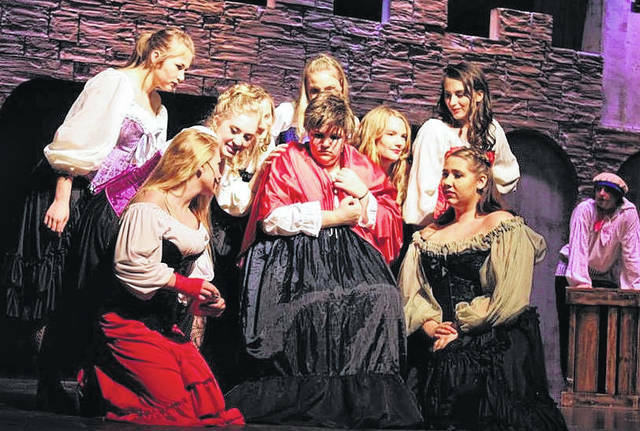 Ball says that to play her part, she based her portrayal on the last time the school presented the play when Kouns’ sister played the part of Madame Thenardier. Ball watched her and learned some important tips. “I loved that part and the way she played it. I was more like the gross, catty-type personality,” which was different, she says, than the way Fern Musick portrayed her character this time around. Senior Jordan Willis portrayed Fantine, a major role, to say the least. At one point, she had to quickly change and immediately have short hair. “I came off stage at one point, and one of the guys literally took a big bobby pen as I twisted my hair up,,and he pulled the wig on as quickly as possible and put the cloak over my head. I really enjoyed playing this part,” Willis says. “I was just in the ensemble, and I liked it a lot, especially because I’m normally in the back, and this time we were right out in the audience. It was really fun,” says senior Marissa McGraw. Freshman Anna Lovins played young Cosette, and did an awesome job playing the frightened, mistreated young lady early in the play. Senior Miriah Stegall, a lovely lady and part of the ensemble, says she personally liked playing the lovely lady more, because she normally stays to herself. This part brought her out of her comfort zone. Senior Layla McGinnis played a factory worker who fought Fantine. “I loved the fight. It was exciting and fun, and some of the punches were real,” she says, which Willis firmly confirms. Senior Austin Scott portrayed Jean Val Jean, a very large role that contained many longer solos. At one point in the days leading up to the performance, he was on voice rest. He nearly lost his voice, but did not fail to impress the audience with his powerful singing and superb acting abilities throughout the play. He has a magnificent voice, and yet says he plans to become a nurse. Hopefully, he will still use his talents in singing and acting in the future. Senior Alec Arnett portrayed one of the other major male roles, which also featured many solos, and he gave the audience a performance that one might expect to hear from a seasoned star on stage. Arnett brought out a marvelous accent and strong voice tone that could only be thought of as special and worth the time to listen to any time. Arnett has a strong personality that comes out in both his acting and singing. Should he continue to pursue music education as he plans, he will surely make a great music teacher someday. Arnett says he thinks the reason Tieman is able to get so many to join the cast and embrace music is because of the small group they are, in general, and the camaraderie they all have at West. He and others say that, although it is not common to have a big male ensemble, it all began in 2012 and has continued to grow. “It’s definitely like a family and brotherhood,” he says. The older boys say they try to get others to join, and note that there are a lot of freshman this year. Everyone in the cast expressed their thanks to Tieman. What makes her special? Everyone in the group says they trust her, and would go to her if they needed to talk. And yet, at the same time, they all agree that when it’s business time, she’s tough and works them to bring out the best they can give. The wonderfully talented group worked so hard to make the performance everything it could possibly be, and it came off without a hitch. The audience gave them a well-deserved, five-minute standing ovation. All proceeds from this play was donated to Friends of Greenlawn and The Compassion Fund for Breast Cancer. The group of talented kids are impressive, not only on the stage, but also in person in their daily lives at school. Many of them will surely become great adults, which can be traced to their opportunity to work with Tieman in this and other plays. Tieman truly exemplifies what it takes to be a great teacher and strong influence for the youth of today.